Help us fight single use plastic waste by opting in for a reusable cup… We all know that plastic waste is having terrible consequences for our planet right? According to Greenpeace an estimated 12.7 million tonnes of plastic end up in our oceans EACH YEAR. Our oceans are becoming a ‘plastic soup’, with plastic waste ending up everywhere from frozen in the Arctic ice to being served in the seafood that we eat. An estimated 50% of plastic products are used once then thrown away. This is why The Green Door Store have introduced a cup recycling scheme to reduce our plastic waste; we do not want to contribute to the destruction of our environment, oceans and wildlife!! But we need your help to make this scheme work. 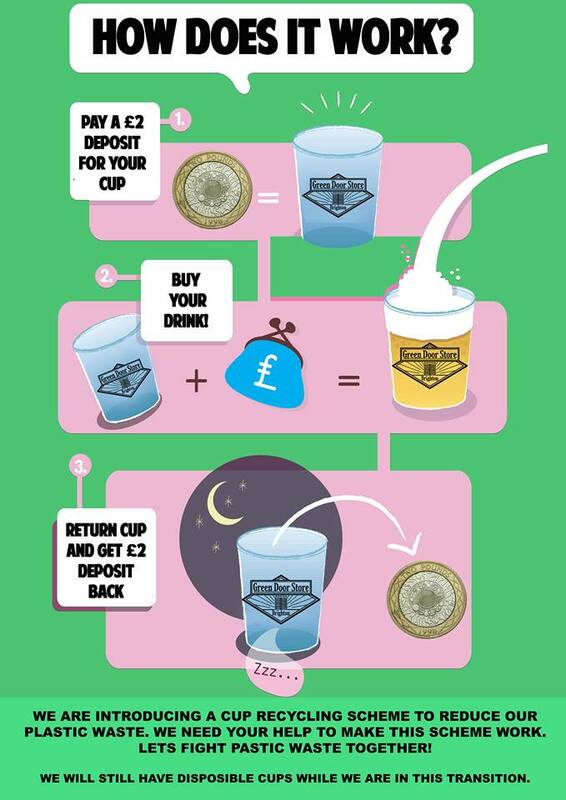 * You pay a £2 deposit for your cup (cash or card). * Buy your drink using the cup and enjoy the snazzy design. * Return the cup and you’ll get your deposit back. * We do the washing up! It is that simple. Small changes can and will go a long way. Lets fight plastic waste together.